It’s been five years since Joe and I launched our food tour business. I just looked through my 2009 Facebook posts, and I saw my status from March 17th of that year: “Lesley is launching a business…. NOW… www.tastecarolina.net” A group of five people signed up for our Durham tour that same weekend, and we were in business. A few weeks later I reported on Facebook that there were six tours booked in one week, and a few weeks after that I mentioned a record 49 people in a week. As reported that summer in a News & Observer article, I lost ten pounds from walking so much. Sure, I was eating a lot, but in small portions throughout the day. Yes, I gained it back when I started hiring tour guides! We continually adapt to the changing landscape of dining out and the increasing popularity of foodie experiences. Running this business has gone from somewhat simple to really quite complicated, but that’s one reason why I love it. I’m proud to have brought over 15,000 people downtown, to have spent hundreds of thousands of dollars at downtown restaurants, and to have employed a dozen people. What is my favorite part of owning this business? It’s the process of facilitating an experience during which couples, families, companies, and groups of friends can have fun together, enjoy lots of yummy food, and explore our historic downtowns with a friendly guide. I get to do this for a living, and I am indeed very lucky. I love showing off my favorite restaurants and their talented chefs over and over again. And I dig the fact that some of the coolest people around – restaurants folks – are really nice to me and my customers. Thank you for being part of our five years. Thank you tour guides, past and present, for being gracious hosts and good friends. Thank you restaurant partners for treating our customers like VIPs… every week for five years. And thank you, Joe, for being a supportive business partner and friend. My husband and my parents believed in this business from the start, and for that I am most grateful. Joe and I during a Chapel Hill Magazine photoshoot. We’re at LocoPops with my dog, Marley, who is enjoying a pupsicle. 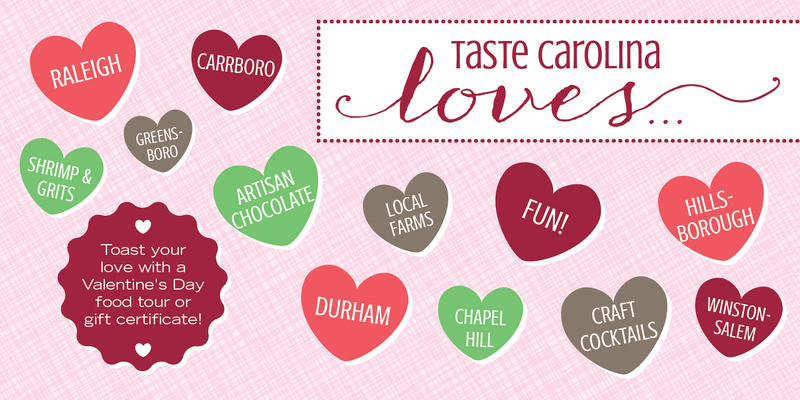 To see the full list of Taste Carolina tours on a calendar, and to register, click here. To visit Taste Carolina’s website, click here. 12:15, Raleigh Loves Lunch Tour, $50 per person. 1:45, Afternoon Delights Tour, $50 per person. 4:00, Downtown Dinner Stroll, $59.50 per person. 4:00, Dinner Stroll of Seaboard Station/ Mordecai/ Oakwood, $59.50 per person. 5:30, Raleigh Loves Cocktails Tour, $50 per person. 1:45, Afternoon Tasting Tour, $50 per person. 11am, Winston-Salem Loves Lunch Tour, $50 per person. 4:45, Winston-Salem Downtown Dinner Stroll, $59.50 per person. February 15th – Food tours take place in Raleigh at 1:45 and 3:30, in Durham at 1:45 and 3:15, in Chapel Hill/ Carrboro at 11am and 3:00, and in Greensboro at 2:00. Gift certificates are available online. 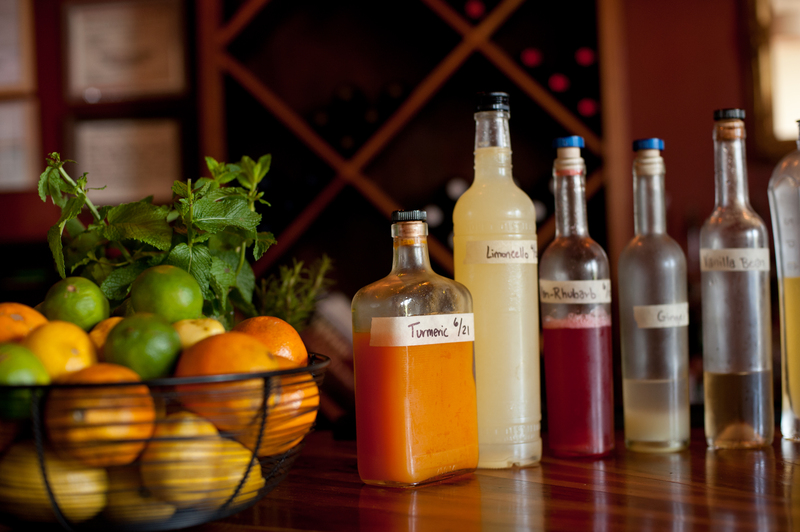 Register for all tours in advance at http://www.tastecarolina.com or call 919 237-2254 for more information. Space is limited. 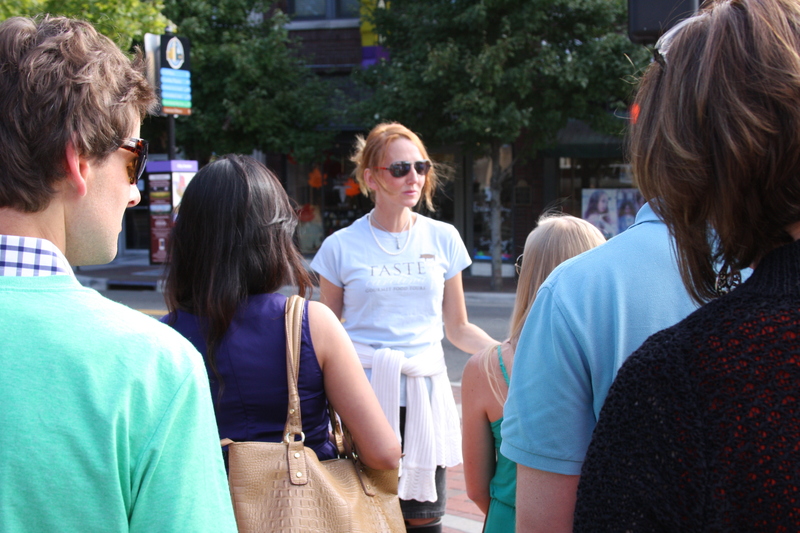 Taste Carolina’s walking tours of downtown Raleigh, Durham, Chapel Hill/ Carrboro, Historic Hillsborough, Greensboro, and Winston-Salem are scheduled for every Saturday, all year ‘round. Registration is open to the public and available on http://www.tastecarolina.com. Private and corporate tours can be arranged for any day or night of the week for groups of eight to two hundred. I bought a new iPhone this week. With its upgraded camera and increased space, I vowed to start taking lots of food and restaurant photos and uploading them to Twitter, Facebook, and to this blog. So I bought the phone on Wednesday and immediately drove to Raleigh to try four new places in one night. One of the Taste Carolina tour guides, Adrienne, joined me in this adventure. We had so much fun! And I took wonderful pictures, particularly at Garland, which is beautiful. When I got home, I immediately went to delete the photos from my Pictures folder. Photos were always saved into two folders on my old phone, and that’s what took up so much memory. But that’s not how it works on the iPhone 5. I lost all of them. Except one – the one I texted to my husband to brag about what I was eating. 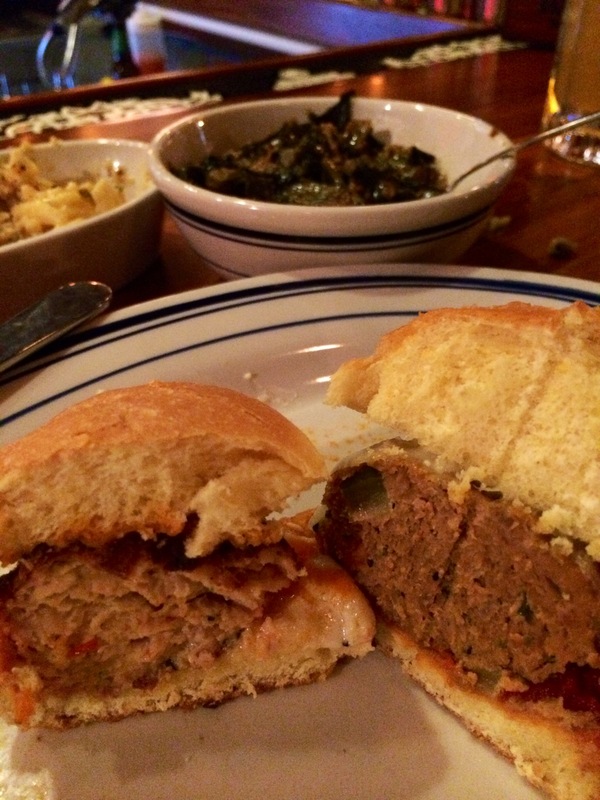 Here’s a picture of two different kinds of meatball sliders, mac & cheese, and collards at the brand new Oak City Meatball. And I’m like, WHAT? I LOVE secret bars! Especially behind secret bookcases. I immediately texted tour guide, Jeanie, who lives downtown, and she texted back that she would head right over. It took her a bit to find it, even though she’s been to The Architect many times. But when she did get there she texted back that it was perfect, that her drink was the best ever, and that we know the owner and he’s happy to host our tours. Best night, and I wasn’t even there. Fast forward to this week. I finally got there to check in out, and it’s awesome. My drink, made from fresh juices and homemade syrups, was delicious, and the bartender was very friendly. There’s a neat view of Hargett Street, too. I can’t wait to go back and to bring lots of people by. Oh, and here’s something cool. There’s a light out front of the bar. When it shows green, there are seats available. When it’s red, no seats available – and no entry. 2) Bida Manda, Raleigh – We have been working with Bida Manda for about a year, but they took a break from our Saturday tours (but not weekday tours) in December due to high volume and a trend toward 5:00 and 5:30 reservations filling the restaurant. Bida Manda is ranked number one on Trip Advisor, currently, and it’s well deserved. The owners, brother and sister Van and Vanvisa, are delightful. They hire nice people and they’re perfectionists: they make sure each customer who comes in has an experience that exceeds expectations. The food is unique and delicious and shows off their Laotian heritage. Bida Manda is only the second full-on Laotian restaurant in the country. In the past I’ve had pumpkin curry, summer rolls, spring rolls (my fave), a shrimp and bacon crepe, and a green papaya salad with beef. This time, Adrienne and I split a roasted pepper stuffed with herb sausage, and crab cakes. Van sent us over a couple of hot toddies with homemade maple syrup, Evan Williams bourbon, and orange peel. Yummy and comforting on a very cold night. Fortunately for Bida Manda, but sad for Taste Carolina, reservations continue to pour in, and there’s just no room for our Saturday groups. But Van was sweet to suggest a Friday evening tour, and I can’t wait to get that going! And we’ll continue to bring in weekday and weeknight corporate groups. 3) Oak City Meatball, Raleigh – OCM opened just this week. 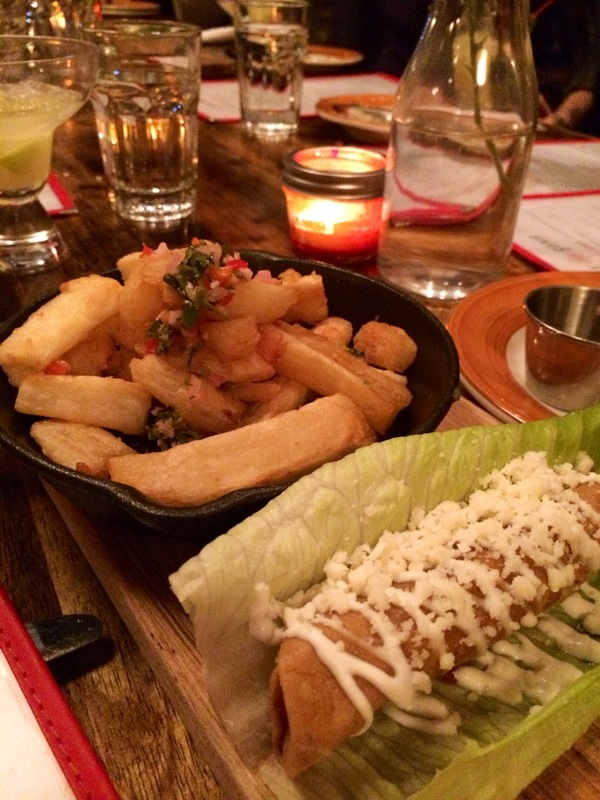 It’s the same owner as one of our favorite places, Calavera, and both are super fun. The night we were there, it was hopping with young, happy people. The service was terrific, the food prompt and yummy, and we had a great time. We tried three different meatballs. Our favorite was the meatball of the day, which was a spicy chicken one. We also enjoyed the traditional beef meatball and the spinach and lentil ball. And that mac & cheese and collards were decadent and terrific. Oh, and because we were so hungry (not), we also ordered cake balls, which are made in-house. We loved the cookies and cream one and were happy to share our leftovers with a couple of random guys sitting next to us. After all, we still had one more place to hit. Oak City Meatball’s menu shows a number of different types of meatballs, and you can eat them on a sub roll, a brioche bun, a slider bun or have them over spaghetti, gemelli, polenta, or risotto – or plain. You also pick a sauce, like marinara (perfect), pesto, cream, mushroom, etc., and a cheese. We ordered three sliders and let the kitchen choose the sauce and cheese. The drinks were all superb. Great beer list, too. I can’t WAIT to go back. 4) Garland, Raleigh – While the Garland crew was building their restaurant last year, owner Cheetie took advantage of the completed kitchen and opened a walk-up window featuring her Southeast Asian fusion/ street food dishes. It was very popular and a fantastic way to preview the restaurant. Cheetie also cooked for our tours and served the food paired with a craft cocktail at her downstairs bar, Neptunes Parlour. It’s been a couple of months since the restaurant opened, but Wednesday was my first time in. It’s beautiful beautiful beautiful. And looked so pretty at 10pm on a cold winter night. Hence all the awesome but deleted photos. Will upload my phantom pictures as soon as I take them again! Here’s to good eating. And thanks for reading. Last night, Taste Carolina celebrated the holidays with a dinner party. I try to give two parties each year where all the tour guides get together, one in January for the holidays and another one in the spring to celebrate Taste Carolina’s March anniversary. Over the years we’ve celebrated at Toast, Acme and Carrboro Beverage Company, Panciuto and The Wooden Nickel, Bull City Burger and Brewery, Centro and Foundation (with Crumb), Vimala’s and TOPO, and, last night, Jose & Sons and Crank Arm. After beer hour at Crank Arm, where we enjoyed really delicious beers, we arrived at Jose & Sons, where yuca fries with chimichurri, beef flautas, and, my favorite bite of the night, tostones (fried plantains) topped with pimiento cheese and bacon, were out on the table. We all ordered margaritas and other drinks. I really loved my cucumber margarita. I’m fortunate to have fantastic tour guides. I make it a point to hire people who are way more bubbly than I am, who are wonderful hosts, resourceful, and who love the concept of Taste Carolina and the cities they show off each week. I think Dean has been with Taste Carolina the longest, and Neesey is the newest. I’ve never had to let anyone go, but I have had turnover: guides who want their weekends back, whose day jobs have become too demanding to have a second job, or who have moved. It’s hard to lose talented employees because they are very hard to replace – and because I like everyone a lot and miss them when they leave the company. I can’t wait for the next party, and I’m thinking that it won’t be a sit-down dinner. Perhaps some kind of stand-up, cocktail-like party. Something high energy for this high energy group! And with an awesome cake. PS: If you are interested in working for Taste Carolina or who know anyone who would make a great guide, please contact me. Cat leads Durham, Chapel Hill/ Carrboro, and Hillsborough tours, but being a certified jack of all trades, she can sometimes be found in Raleigh, too. She’s a natural host who makes everyone feel at ease while keeping the group entertained. What is your occupation? Director of Marketing at Straw Valley Food and Drink. Where are you from? Dayton, Ohio- The birthplace of the Wright Brothers. When did you move to North Carolina? 2011. What do you love best about North Carolina? The weather and ample supply of pimento cheese. What do you love best about leading food tours? Meeting new people and showing off our area. What are your favorite foods? (List three) Pizza, all kinds of cheese, and eggs Benedict. What is your comfort food? Any kind of breakfast food. What is your favorite drink? Bourbon and ginger. What food/s won’t you eat/ try? I will try anything once. Who is the one person you would love to cook with? Jacques Pepin. What are your hobbies? Watering plants (I won’t call it gardening yet), volunteering with the Junior League of Durham and Orange Counties, and riding bikes. Favorite restaurant? Deep Wood in Columbus, Ohio will be my favorite for a long time. Its where I got married! Favorite sandwich? BLT with a fried egg. Favorite cookie? Gingersnaps, the soft homemade kind. Chris leads Durham tours. He and his wife, Sandy, are our first husband/ wife tour guide team! Chris is always entertaining and full of insight. What is your occupation? Global Account Director. Where are you from? Born and raised in New Jersey but have lived in the following metropolitan areas prior to moving to NC: New York City, Philadelphia, Boston, San Jose. When did you move to North Carolina? 1999. What do you love best about North Carolina? The weather is wonderful; not too cold in the winter, not to hot in the summer, and long spring and fall seasons. Plus great beaches, mountains, and fun cities to explore. What do you love best about leading food tours? 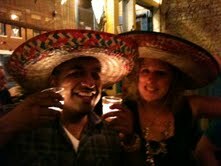 The people: I always meet interesting people and have fun hosting them on their culinary tour of the city. I also learn something new each time I take a group on a tour… something about the city’s history I didn’t know, or a restaurant I have not been to yet, or even a great new movie to see. What are your favorite foods? (List three) I’m a meat eater, so I enjoy many forms of animal protein, but Bacon is probably at or near the top, along with barbecue. I also love most Italian food, Pasta being a favorite. As for sweets, I’d put Chocolate at the top. What is your comfort food? When I’m not feeling well, I go for simple: chicken noodle soup or a grilled cheese sandwich. What is your favorite drink? Every day I like ½ sweet tea (even after 15 years, I still can’t drink 100% sweet tea). On the alcohol side, I like both beer and wine, and my favorite cocktail is a gin & tonic (Tanqueray please). What food/s won’t you eat/ try? I’ll try anything once, or twice. Who is the one person you would love to cook with? Alton Brown. He seems like a cool person to cook with, but I’d also like to ride motorcycles with him (a fellow BMW bike owner). What are your hobbies? Traveling, Skiing, Working out, Hiking, Motorcycling, Yoga, Tennis, Golf, Reading. Favorite sandwich? An Italian sub or a French dip. Favorite cookie? It’s not often I find a cookie I don’t like, but I’d have to pick the old Chocolate Chip as top of the list. 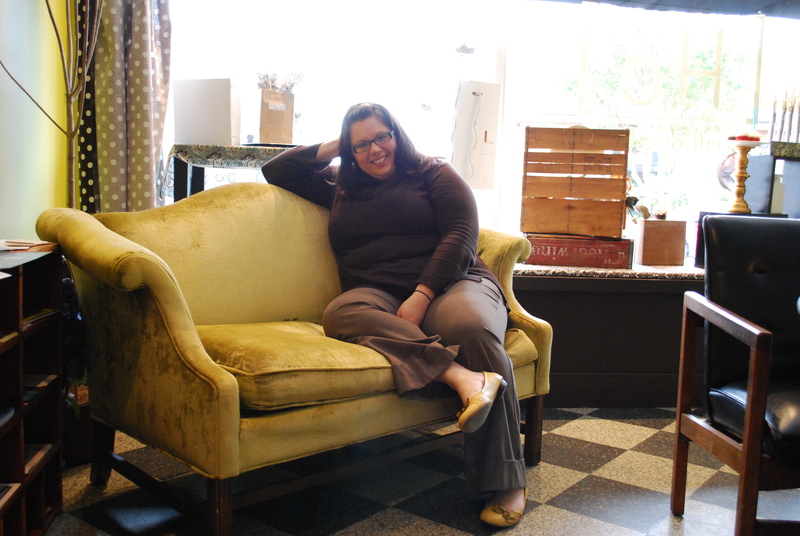 Jiliana Dulaney, owner of Haute Chocolate in Winston Salem, has a great thing going. Her chocolate shop on Burke Street showcases unique flavor combinations, like pumpkin curry. Each truffle is inspired by an experience or person that Jill has encountered. 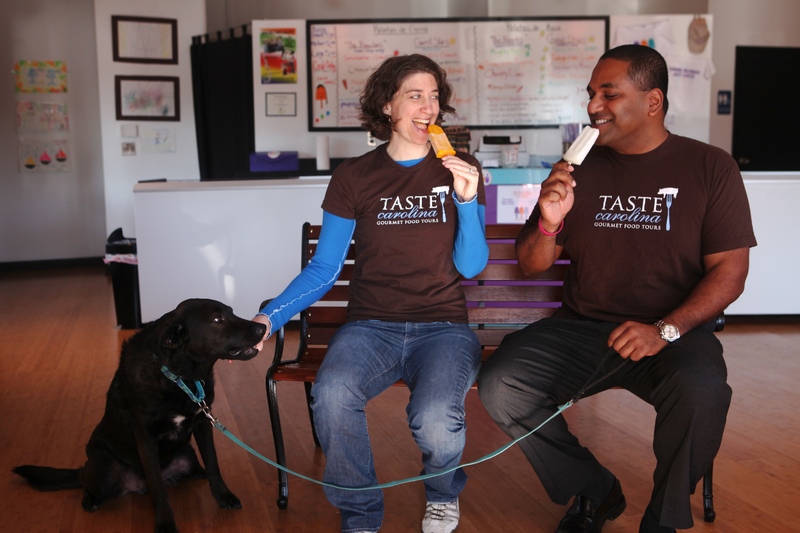 Just as the flavors work together to highlight their best features, Jill and Winston-Salem bring out the best in one another. Jill will offer her perspective on foodie entrepreneurship in part 2 of this interview, but first, she opens up about herself, including her deep dislike of mayonnaise. Occupation: Chocolatier and Owner of Haute Chocolate in Winston Salem. Where are you from? Chicago, Illinois. When did you move to North Carolina? September 2006. My parents had moved here because my dad took over a new sales territory. They loved it here, and I was like “Oh, I’ll try it out and see what happens.” I thought I was going to hate it, and I gave myself six months to save up money to go back to Chicago. That never happened… I met my husband a week after moving here. He’s the reason I stayed. What do you love best about North Carolina? Probably the weather, and the fact that you can go to the mountains or the beach within just a few hours, even though I don’t get to enjoy that as much as I used to. What type of music do you listen to when you’re cooking in the kitchen? It varies. It’s a lot of angry girl music, like Ani DiFranco and Metric. And sometimes I’ll listen to Nicki Minaj or Dead Mouse – it just depends on my mood. But when I’m in the kitchen working, I need music. Top 5 favorite foods? (anything goes) (1) Number one would be my grandma’s spaghetti sauce. Even though she’s not alive anymore, that would be my number one, hands down, of all time; (2) I love Thai food and Indian Food, like Pad See Ew and Vegetable Korma; (3) Meatloaf. I don’t know why, but there’s something about it; (4) Obviously chocolate; (5) Cupcakes and desserts. What is your comfort food? Ice cream. I like coffee and chocolate ice cream. Are there any foods you won’t eat/try? Oh… no insects or brains, for sure. I’m not really into seafood, so probably nothing seafood-related. And I hate mayo, mustard and ketchup. Anything that those three in it, I will throw away. What is the last memorable meal you’ve eaten recently? I would say it was probably when my sister, my friend, Carla, and I went to Sweet Potatoes for dinner after a cupcake tasting we had here. We just had so much fun. It’s just nice to have good girl friends – and a sister, obviously. The ingredient you currently can’t stop using is: Probably cinnamon, or pumpkin pie spices. I love cinnamon; I put it in everything. You have a day with absolutely no obligations. How do you spend it? I would probably waste part of the day sleeping, laying in bed, or watching TV. I recently took up golfing. My husband has been teaching me, so we would probably go out to the driving range. And then we would go out to dinner. What kind of cooking do you do at home? I don’t do this often, but I’d do a three-course meal. First there would be lettuce wraps, like PF Change’s, for the appetizer. One of my favorite things to cook at home is potatoes des faire (fancy name for scalloped potatoes), and Lemon Chicken Paillard. I’d try to make Crème Brulee for dessert. We used to go to Print Works Bistro a lot, because we got married at Proximity. And they had that [chicken and potatoes], and I was obsessed with it. That dish was actually the inspiration for my Lemon Rosemary Truffle. What are some cooking challenges or techniques you would like to tackle? Making Crème Brulee. I’ve never even tried it, and I know it’s not the easiest thing in the world to make. And making croissants – I’ve always wanted to know how to make a croissant. I don’t think it’s necessarily hard, but rather it’s the time that it takes to make them. But man, they’re so good. Who is one person you’d love to cook with? My husband. And we do cook together. I usually do the side dishes and he does the main course. I am still full. My friend, Colleen, who has masterfully organized TerraVITA, a foodie festival three years running, took on a fundraiser for the Carrboro Farmers’ Market the Thursday before the main TerraVITA event. Twenty of the best chefs around brought dishes to share in a potluck style. The picnic was outside at the market at night, and, though it was cold, we had a wonderful time. But I am still full. Aaron Vandemark, from Panciuto in Hillsborough, brought parfaits of crisped beef, white sweet potatoes, and cole slaw. It was meaty, fresh, and delicious. Kevin Callaghan, from Acme, brought deviled eggs, squash pickles* [see recipe below], and some of the best macaroni & cheese ever. And speaking of mac & cheese, Jimmy Reale, from the Chapel Hill Country Club, made pimiento mac & cheese… amazing. Vimala Rajendran, from her Curryblossom Café, brought lovely spiced rice and braised butternut squash. Andrea Reusing, from Lantern, brought pork that had been steamed in banana leaf… ridiculously good. There were fantastic meatball sliders contributed by Adam Rose from Il Palio. And on and on and on. For dessert, I enjoyed Bill Smith, from Crook’s Corner’s, banana pudding, and a sweet and fresh muscadine cobbler from Saxapahaw General Store’s Jeff Barney. Taste Carolina’s Chapel Hill/ Carrboro food tours have been visiting the Carrboro Farmers’ Market just about every Saturday for the last four years, where we arrange for substantial tastings with farmers and vendors. We see all these chefs roaming about, picking up boxes of goods, and chatting with each other, the farmers, and the market-goers. Many times a year the chefs offer cooking demonstrations or tastings at the Market. The Carrboro Farmers’ Market is over 30 years old and often mentioned as one of the best in the country. People love it, and it showed at this dinner. I rolled home and was asleep a few minutes later. A few hours after that, I woke up and thought that I had never been so full in my life. Later on still, I woke up and couldn’t feel my feet. The food had turned my circulation to sludge, I guess. It was a little scary, but nothing a few glasses of water didn’t cure. My post-picnic diet lasted a couple of days, but I was fully back by Saturday – at TerraVITA, where I did it all again, just with different dishes. There was less mac & cheese but more pate and chocolate – and plenty of wine. Mix sliced onions and squash in a large bowl. Sprinkle with Kosher salt and toss. Place onions and squash in a large colander and cover in ice (this helps keep the pickles crisp). Place where it can drain. After icing the squash, put remaining ingredients into a large non-reactive pot and bring to a simmer. Let aromatics simmer for 30 minutes or so to flavor the vinegar. Strain vinegar mixture and clean pot of any of the pickling spice that may be stuck to the sides. Discard used spices. Put squash mixture into the non-reactive pot. Add vinegar. There may be more squash than vinegar, but don’t worry. The squash will release water as it cooks. Stirring occasionally, bring back to a simmer and cook briefly. Squash must not be raw but also should not be stewed. Tasting is the only way to know. Adjust salt if necessary. For us, these are refrigerator pickles. But they can be put up like traditional pickles to enjoy year round.